Nia with Dominic Conway, Chairman, and Pat Neil, Secretary, of the Friends of Cwrt Farm. Friends of Cwrt Farm organised a magnificent barbecue on Monday evening to celebrate the Queen’s Diamond Jubilee, with the evening culminating in the lighting of a beacon by Nia Griffith MP. Guests were treated to top quality Welsh produce – sausages from Cig Calon Cymru and Welsh Black beefburgers, cooked by the Friends and their helpers, and all this in the splendid setting of the imposing Cwrt Farm building. The event was supported by a grant from Pembrey & Burry Port Town Council and attended by the Mayor Cllr Mary Wenman , and her deputy Cllr Moira Thomas. Whilst up at Cwrt Farm, the Party was in full swing, down at the Butcher’s Arms, members of Pembrey Football Club were getting ready to set out on the torch procession, which took in Lando Road, Danlan Road, Gwscwm Road, Ashburnham Road and Randall Square before making the ascent up Mountain Road to Cwrt Farm. There the torch was met by a guard of honour by Llanelli Sea Cadets and handed over to Nia Griffith MP. 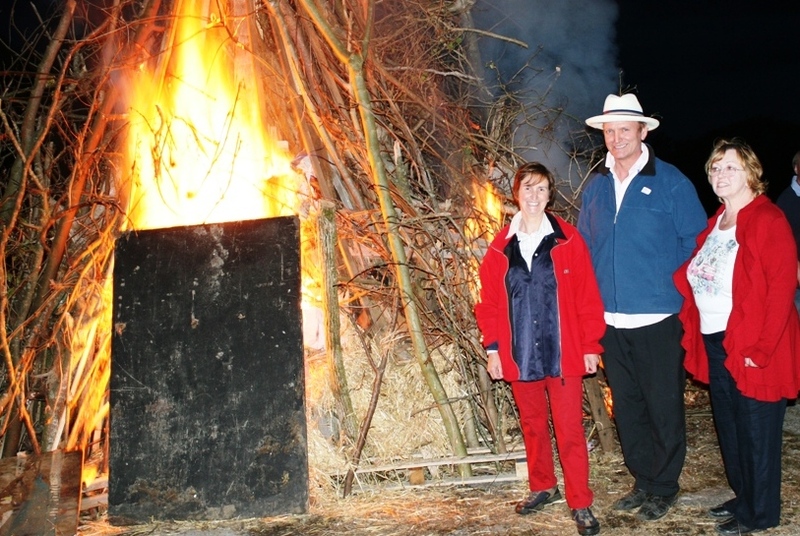 Nia then took the torch, and, flanked by Dominic Conway, and Pat Neil, Chairman and Secretary of the Friends of Cwrt Farm, she set the beacon ablaze at precisely 10.26 am, to link in with the series of beacons being lit across the country in honour of the Queen’s Diamond Jubilee.